Native to Europe and Asia. Introduced and naturalized in North America. Dry. Roadsides, old fields, disturbed sites. Full sun. This is a 16″ to 32″ tall, erect, perennial forb that rises on 1 to 3 stems from a thick caudex. It can form large clumps. The stems are erect, stout, unbranched below the inflorescence, and covered with both glandular and non-glandular hairs. The leaves are alternate. Lower leaves are on hairy stalks up to 4″ long. The are palmately divided into 5 or 7 leaflets. The leaflets are narrowly inversely egg-shaped with the attachment at the narrow end, 1″ to 2″ long, and about ¾″ wide. The margins are coarsely toothed around the entire margin, including near the base. The upper surface is green and is covered with short, soft hairs. The lower surface is pale green and is covered with long, soft or stiff hairs. Upper leaves, above the point where the flower stalks begin to appear, are similar but smaller and divided into 3 leaflets. The inflorescence is a flattened, branched cluster of many flowers at the end of the stem. The flowers are ½″ to 1″ wide. The 5 petals are pale yellow. They are inversely heart-shaped, broadest at the tip with two rounded lobes separated by a broad notch, and tapering to a narrow, wedge-shaped base. The 5 green sepals are shorter than the petals and alternate with the petals. The 5 bractlets are dark green and about as long as the sepals when the flower is fully open. They alternate with the sepals and are hidden below the petals when the flower is viewed from above. There are 20 to 30 yellow stamens with brown and yellow anthers. There is no floral scent. This is the only cinquefoil in Minnesota that has pale yellow flowers. 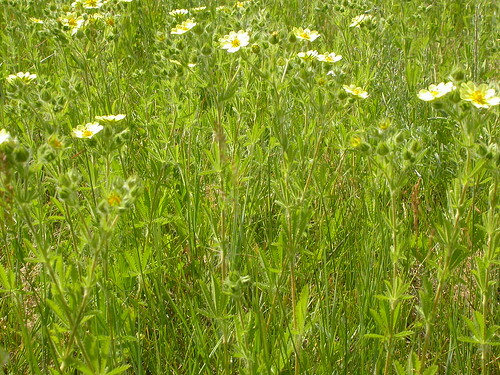 The erect stature, palmately divided leaves with up to 7 leaflets, flower cluster at the tip of the stem, and pale yellow flowers, taken together, distinguish this from all other cinquefoils in Minnesota. 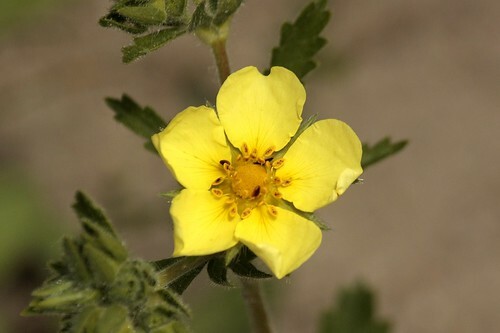 Tall cinquefoil (Drymocallis arguta) leaves are pinnately divided into 7 to 11 leaflets. The petals are yellowish-white, cream colored, or nearly white, and are rounded at the tip, not notched. Fruit: multiple achenes. A listed noxious weed in Montana but efforts to eradicate it can reduce native biodiversity. Perennial herb with erect and distinctly hirsute stems 20-50 cm tall, well-developed stem leaves, and short-petiolate basal leaves, common in open dry settings including meadows, open understory, roadsides, and pastures. 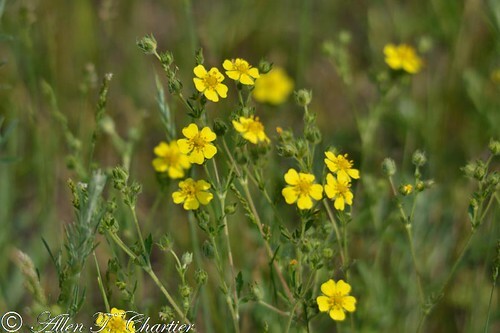 Potentilla recta (Sulphur Cinquefoil or Rough-fruited Cinquefoil) is a species of cinquefoil. De rechte ganzerik of zwavelvijfblad (Potentilla recta) is een meerjarige plant in de rozenfamilie (Rosaceae).